1--A perfect storage shelf that helps you collect all your idle items in your room. 2--This shelf can be used to put your books, folded clothes, toys, handicrafts, making your room looks cleaner and tidier. 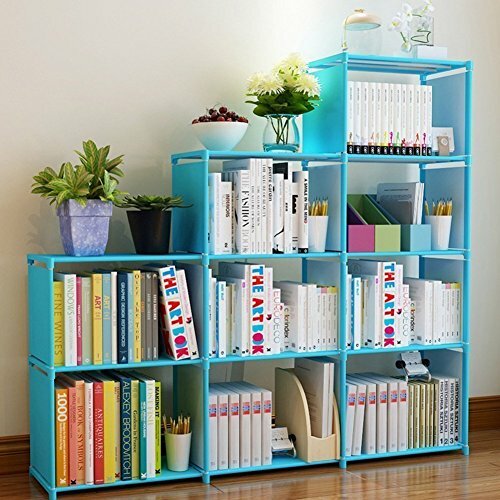 3--9 grids storage shelves provide enough space to hold various things and save your house space. 4--A wonderful DIY experience when you assemble it. Function: Storage books, shoes, clothes, ect. The bookcase is designed to help you keep things organized and at the same time it could help you decorate your house into a modern style! ★Sturdy & Durable--Constructed from steel tube, high quality plastics connectors and water-proof non-woven fabric shelf. Quality PP panel providing perfect stability and durability,eco-friendly and odorless. ★Multifunctional--- Each storage cube with a size of 40.5 x 30 x 28cm/15.8 x 11.7 x 10.9"( L x H x W). Which could be used for book displaying, shoes storage, toys collection, small green plant and other decorations etc, satisfying your daily storage needs. If you have any questions about this product by Meharbour, contact us by completing and submitting the form below. If you are looking for a specif part number, please include it with your message.